Don’t blame the writer for this drivel. The editors at the Post are the ones responsible. They hold all the power, and big PA at State has been cutting deals with them. After Mary Ryan got fired due to “unauthorized” leaks back in 2002, State started working the hometown paper. (They never had to work the NY Times, Times has almost always been in the bag for the Foreign Service). A lot of FS heavies (Black Dragons in DS speak) put pressure on the Post editors (and owners) to not run so many negative stories. As an incentive, big PA gives “exclusives” to the Post, in return for not running or downplaying the unauthorized leaks, and running a few puff pieces, like this one. How would I know ths? Some of the young flacks in big PA have big mouths. They even boast about this in FSI presentations. 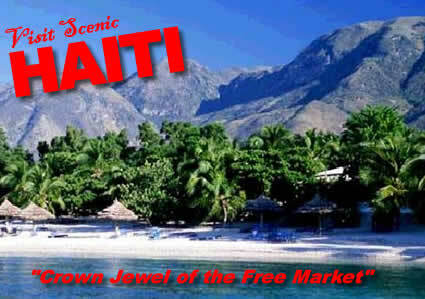 Haiti’s biggest problem is the NGOs. Each one is focused on their chosen project and it is in their best interest to keep the government weak and out of their business. Most of those NGOs have pull with the U.S. State Department and use that power.